In 19th century North America, evangelicalism basically referred to a loosely associated, intradenominational coalition of Protestants who held to the basic reformational doctrines of sola fide [faith alone] and sola scriptura [Scripture alone], mediated through the revival experiences of the Great Awakenings. David Bebbington’s evangelical quadrilateral—namely, that the common denominator among evangelicals is the combined belief in biblical authority, cruciformity, conversionism, and evangelism—has value but lacks specificity when applied to the North American experience (instead of just evangelicalism in Great Britain). North American evangelicals not only believed in the Bible’s general authority but also its inerrancy and infallibility. They not only believed in conversion but also saw revivalism as a way in which God might work. The following are ten key events that took place in the relationship between evangelicals, fundamentalists, modernists, and neo-evangelicals during the 20th century in North America. In the wake of late 19th century Darwinian evolutionary theory and with the concomitant rise of biblical higher criticism in the early 20th century, two wealthy businessmen (oil man Lyman Stewart [1840-1923] and his brother Milton] funded a 12-volume series on The Fundamentals: A Testimony to the Truth (1910-1915). These 90 essays were written by 64 English and American pastors and theologians, most of them denominational evangelicals, setting forth what they agreed were the “fundamentals” of the faith. Between 2 to 3 million copies were distributed. In 1920, Baptist journalist Curtis Lee Laws (1868-1946) wrote an editorial (“Convention Side Lights,” Watchman-Examiner 8 [July 1, 1920]: 834) offering new nomenclature to capture the current state of conservative dissent. In its place he suggests “that those who  still cling to the great fundamentals and who  mean to do battle royal for the fundamentals shall be called ‘Fundamentalists. '” In other words, they were the type of people willing to continue the fight for the sort of truths laid out in The Fundamentals pamphlets, the type of people who were joining the World Christian Fundamentals Association. progressivist values that undermined the fundamentalist understanding of the Christian life (e.g., dancing, drinking, gambling for some; others would focus more upon political movements like communism in the 1950s, or upon sexual mores, especially into the 1960s). Others would later want to add additional items to the list like belief in the premillennial return of Christ. On May 21, 1922, Rev. 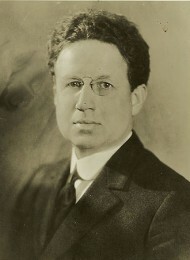 Harry Emerson Fosdick (1878-1969) preached a provocative sermon to the First Presbyterian Church in New York City, entitled “Shall the Fundamentalists Win?” Referring to himself as an evangelical, he sounded a warning against the anti-modernistic obscurantism and anti-intellectualism of the fundamentalists. They could believe what they wanted about the virgin birth, the inspiration of Scripture, and their understanding of the atonement, but their boundary-drawing was a danger to the church and must be firmly resisted. He called for increased tolerance of spirit—though it seemed he mainly wanted the tolerance to be a one-way street toward his brand of modernism. Fosdick understood modernism to be the spirit of the age, and he viewed Christianity as needing to accommodate its categories and to infuse it with a Christian ethic of love. 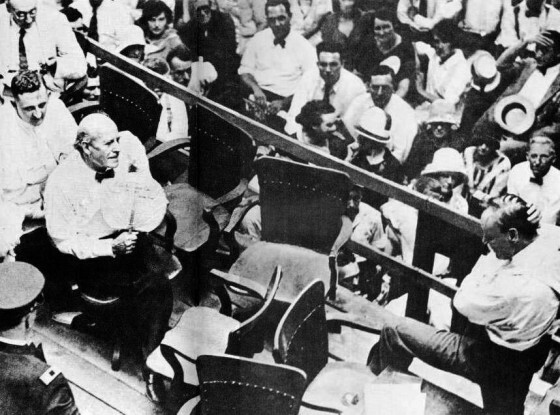 In 1925 the so-called Scopes Monkey Trial transfixed the nation as the ACLU orchestrated a trial of John Thomas Scopes (1900-1970), a young biology teacher willing to test the state laws on the teaching of evolution. The trial pitted famed defense attorney Clarence Darrow (1857-1938) against the charismatic prosecutor William Jennings Bryan (1860-1925), a progressivist politician who was a confident fundamentalist in biblical doctrine. Through the combination of acerbic reporting by H.L. Mencken (1880-1926), unforced errors by Bryan, and (later) a historically inaccurate play and Hollywood movie, the trial would eventually become symbolic in American culture for fundamentalism’s mean-spirited anti-intellectualism and even buffoonery. 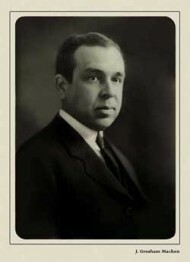 In 1929, J. Gresham Machen (1881-1937)—a brilliant Reformed New Testament professor at Princeton Theological Seminary, who had studied under Adolf Schlatter in Germany—left the school after it reorganized its curriculum, having opened the door (in Machen’s view) to modernist compromise. He would then found Westminster Theological Seminary (1929) and later The Orthodox Presbyterian Church (1936) after he was tried and found guilty for continuing his Independent Board for Presbyterian Foreign Missions (IBPFM), designed so that money contributed by orthodox Presbyterians would end up going to support likeminded orthodox Presbyterian missionaries rather than modernist Presbyterians like Pearl Buck (1892-1973). Machen was a non-dispensational example of conservative dissent. He did not particularly care for or embrace the “fundamentalist” label, but he understood that their belief in premillennialism (while in error, in his judgment) was an error of a different kind than that propagated by the modernists. In 1923 Eerdmans published Machen’s landmark book Christianity and Liberalism, arguing that modernistic liberalism was not a sub-species of Christian orthodoxy but rather a different religion that must be rejected once and for all. For example, he wrote, that the “Church of Rome may represent a perversion of the Christian religion; but naturalistic liberalism is not Christianity at all” (p. 52). When Machen died in 1937 at the age of 55, after a bout with pneumonia, it marked the passing of an era in 20th century fundamentalist-evangelicalism. a downplaying of intellectual engagement with the academy in the desire to avoid influence by modernism. 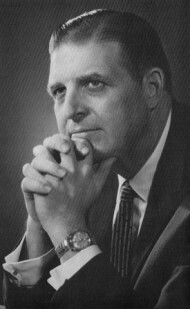 In 1941 Harold John Ockenga (1905-1985), pastor of Park Street Church in Boston and a former student of Machen’s, issued the call for “neo-evangelicalism,” and the National Association of Evangelicals was formed that year. (Carl McIntire [1906-2002] was originally to be part of this, but broke off to form his own fundamentalist association that would define itself in many ways as a corrective to and critic of neo-evangelicalism.) This group was broadly ecumenical, at first encompassing not only evangelical denominationalists but also holiness, Pentecostal groups, and independent ministries like the Salvation Army. 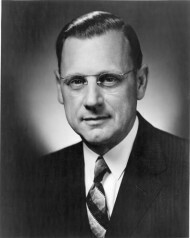 In 1947 Ockenga co-founded Fuller Theological Seminary with Charles E. Fuller (1887-1968), host of the popular radio broadcast “The Old-Fashioned Revival Hour.” The initial faculty—including Carl F. H. Henry (1913-2003)—were evangelical intellectuals who wanted to write a new chapter in confessional Christian higher education. That same year Eerdmans published Henry’s The Uneasy Conscience of Modern Fundamentalism, which argued against both fundamentalists and liberals who were obscuring the gospel by focusing upon secondary issues. In 1956 Billy Graham (1918-) founded Christianity Today, designed to be a forward-looking, positive alternative to The Christian Century. Henry was tapped as the magazine’s first editor. 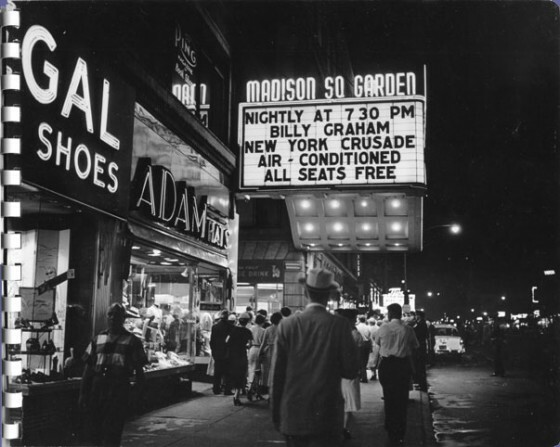 An epochal internal rift occurred in the summer of 1957, as Billy Graham engaged in his historic evangelistic crusades in Madison Square Garden with record crowds. From Graham’s perspective, he needed to partner with local pastors and churches in the area to ensure a warm reception of collegiality rather than to exacerbate competition and suspicion. This would also be a key part of the follow-up effort for those who had professed faith at the meetings. The strategy worked and Graham was not only welcomed by the local churches (many of them Modernistic) but also by the masses. But this methodology was increasingly seen as problematic and troublesome, especially for fundamentalists in the South. 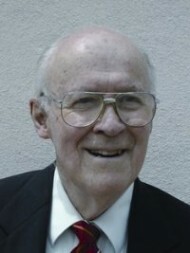 Bob Jones Jr. (1911-1997), with the support of his father Bob Jones Sr. (1883-1968), founder of the eponymous Bible college, made it clear to Graham and his supporters that partnership with the modernists was a bridge too far. They felt that by having modernists on the platform—a visible endorsement, replete with asking some of them to pray and entrusting the gospel follow-up to some of their churches— Graham was engaging in sinful compromise and offering an implicit endorsement of the enemies of the faith. For the Joneses, and those who followed in their lead, this meant that they must separate not only from Graham himself, but from all those who supported Graham. Thus emerged a new phase in the history of fundamentalist-evangelicalism, as the so-called “secondary separationists” began to have increasing influence, especially in the South. 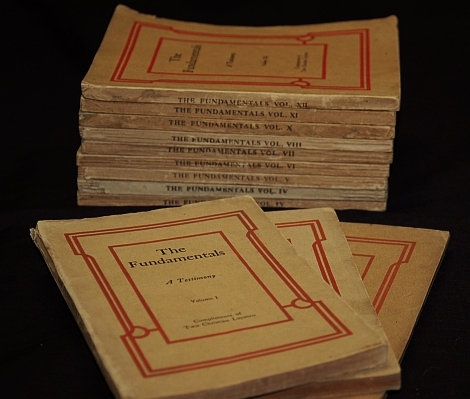 Whereas “fundamentalism” had originally been a conservative dissent movement within the denominations (working for their reform), a new segment of it defined faithfulness as leaving compromising denominations that had become apostate in their view—and also rejecting any fellowship and partnership with those who refused to do the same. Emerging from this 1957 division, and continuing through the intra-denominational controversies of the Lutheran Church Missouri Synod and the Southern Baptist Convention into the 1980s, there was conservative agreement that personal holiness was a necessity and that separation from moral sin was required. But beneath this general principle, there were three overlapping approaches to separation within fundamentalism. First, there were denominational reformers who believed they should stay within a denomination and fight for its doctrinal and moral purity. Second, there were denominational separatists who believed that faithful Christians should extricate themselves from denominations and professing Christians influenced by modernism and therefore apostasy. Third, there were ecclesiastical separatists who were also secondary separationists, refusing to have fellowship with fellow conservative dissenters who did not withdraw from apostate denominations. What must be noted here, and is often overlooked in discussions of fundamentalism, is that the original fundamentalists were in categories 1, and sometimes 2. But category 3 was largely the result of post-1957 fundamentalism and represents a new phase of development. In 1962 there occurred another event that, in my view, may be the second most important development after the 1957 split. On December 1, at the conclusion of a three-day planning retreat for the faculty and trustees of Fuller Theological Seminary, the issue of revising the school’s creedal statement on inerrancy was on the agenda. Ockenga, the school’s president in absentia who had helped to draft the original informal statement in a Reformational-Princetonian direction, wondered why the creed needed to be revised in the first place. Daniel P. Fuller (1925) was the only child of the school’s founders, Charles and Grace Fuller. He had long abandoned his father’s dispensationalism, and had gone off to get a second doctorate in Basel with serious doubts about inerrancy—doubts that were solidified in his studies with Oscar Cullmann and after a conversation with a former fellow Fuller student who had gone on for a PhD at Harvard and expressed his opinion that Fuller would not survive if it retained its outmoded fundamentalist doctrine of inerrancy. Fuller informed Ockenga that the Bible did contain errors on non-revelational details (observable but not essential matters) and that an appeal to the original autographs would not solve the problem. Fuller’s nuanced view—which had much to do with the hermeneutics of authorial intent and divine accommodation—sought to retain the term “inerrancy” because he thought every word of Scripture was inspired by God and inerrant in its purposes, but it was clear he was breaking with the historic Warfieldian-Princetonian understanding. The progressive-conservative divide was exacerbated and solidified and between the faculty—between those who were more comfortable with a traditional understanding of inspiration and those who wanted more progressivist changes. “Black Saturday” forever changed the direction of the school and stands for a significant change in the relationship between fundamentalism and neo-evangelicalism, as progressive evangelicalism proffered itself as a new third way.